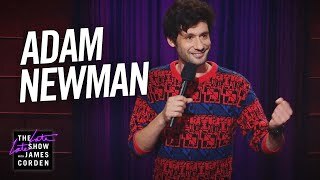 Adam Newman is taking the comedy scene by storm. He has appeared on Comedy Central’s The Half Hour, @midnight, The Late Show with David Letterman, and Last Week Tonight with John Oliver. Last year, Adam released his second stand-up album, Killed, and toured with Bo Burnham on the Make Happy tour. Adam recently relocated to Los Angeles from New York City.